Honu Haven is just a short walk to Kailua Beach and Kailua Town, where you'll find great restaurants and shops. Poppy's Lanai, a bright, airy detached 500 sq ft studio comfortably sleeps 4 with a queen bed, a double futon couch and Aerobed. The Lanai kitchenette has a microwave, double hot plate, coffee maker, convection oven and refrigerator/freezer. There is a large bathroom with a walk in shower, dresser, toilet and sink. The Lanai opens out to the pool and gardens. 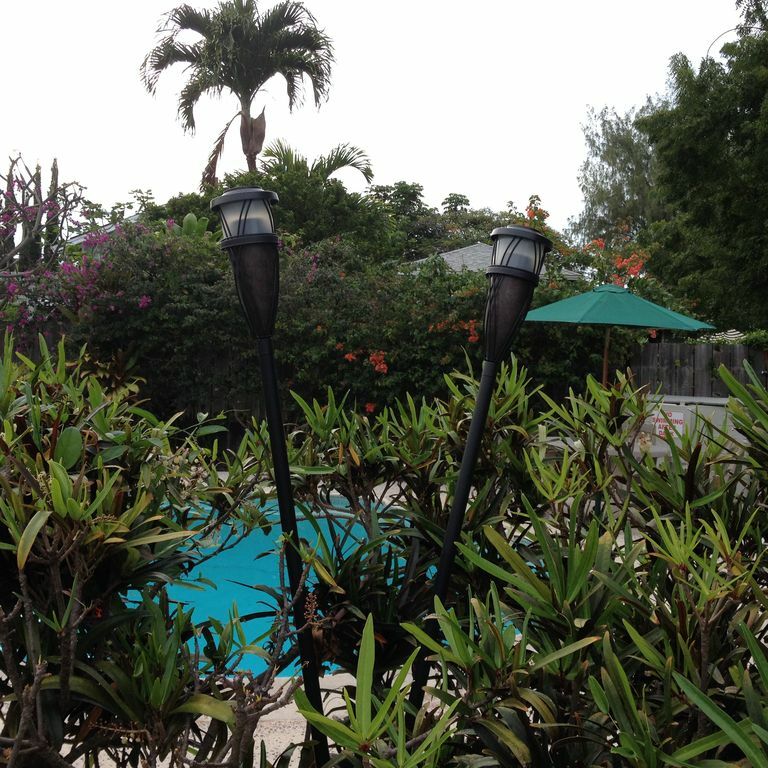 The backyard is fenced and surrounded by beautiful tropical plants. A patio table and a BBQ are provided on the pool deck for guests to enjoy outdoor dining. The pool is professionally maintained and for all guests to enjoy. You will find chaise lounges, floating rafts, as well as pool toys. There is also a Cottage studio on the property that sleeps 2. The Lanai and Cottage may be rented to accommodate 6 people. Please visit VRBO 987837. Poppy's Lanai is an easy 10 minute walk to Kailua Beach on neighborhood streets. Laundry room is outside and is shared by all guests. Laundry soap and stain remover are provided. Laundry room is outside and is shared by all guests. The dryer is coin operated. Dryer sheets are provided. There is also a clothes line. Dishes, serving pieces and flatware are supplied for 4 people. My husband, 7 month old daughter and I stayed here for three nights and were very pleased. We stayed in the cottage and it was so sparkeling clean and well stocked. Everything one needs for on vacation including some nice touches like coffee, shampoo, a cooler and other beach supplies. Bed was comfortable. Onsite laundry was a huge plus. It’s a very quiet area, which is what we preferred. The pool area was nice. Just note that this is a shared area with other guests and the hosts. There’s also a grill you can use which we appreciated along with outdoor seating. Location is great, too. Very close to beaches and downtown area. If you are here on a Thursday then check out the local Farmer’s Market for dinner. Hike Pillboxes. Sunrise on the beach is a great start to your day. The hosts were great and accommodating. We’d defintely return. Well-priced, clean unit in Kailua. Friendly owners with good communication. Bigger than hotel room, but a little tight for 4 — we had 2 adults and 2 teens. would be perfect for a couple, a family of 3, or one with 2 young kids that could share the futon (once you put out the aero bed, it gets cozy). Nice location in walking distance to many restaurants and shops. About 15 minute walk to Kailua beach, further to Lanikai. Would rent again. Very nice property. Well organized with many extra ammenities. My kids loved the pool and all of the little places they could explore in the beautiful landscape. Appreciate the free coffee and how well everything was organized. You can tell they have been renting properties for a long time. Loved having pool to jump into! Poppi Lanai was a cute beachy rental in great location within walking distance to shopping & eateries downtown or to Kailua beach. Our own pool was awesome & we enjoyed cooling dip & basking in sunshine within gardens of beautiful blooms surrounding us in private tropical oasis. Small kitchen has what u need to cook meals but step down can be dangerous if u miss step (friend fell). Bed n futon are firm which friend slept great on but l missed eggcrate foam pad for old arthritic hips. Open window shutters for nice breeze thru house & w fans comfortable sleeping temps. Plenty of beach n regular towels, literally anything u need is provided to have awesome relaxing escape! Love this place. Just remember, this is no a hotel, you have to sleep with the windows open, beautiful breeze. Traffic noise from the main street can be a bit loud. The reservation is refundable upon cancellation at least 30 days prior to arrival, minus a $100 reservation fee. No refunds are made after occupancy has begun. The guest agrees to pay for any damages to the property caused by him, or any member of his party, and agree that any damage incurred will be charged to him and payment will be due upon notification.